Panjim, July 2nd 2018: Hon’ble Minister for Tourism, Mr. Manohar Ajgaonkar launched the special pilgrimage package tours from Goa to Tirupathi during a function held at Paryatan Bhavan on Monday evening. The first luxury tour bus was flagged off by Mr. Ajgaonkar amidst much fanfare and fervor. Also present on the occasion was the Chief Secretary Mr. Dharmendra Sharma, I.A.S, Secretary of Tourism, Mr. Sheo Pratap Singh; Director, Dept of Tourism, Mr. Menino D’Souza; Board of Directors of GTDC; and other officials from Goa Tourism. 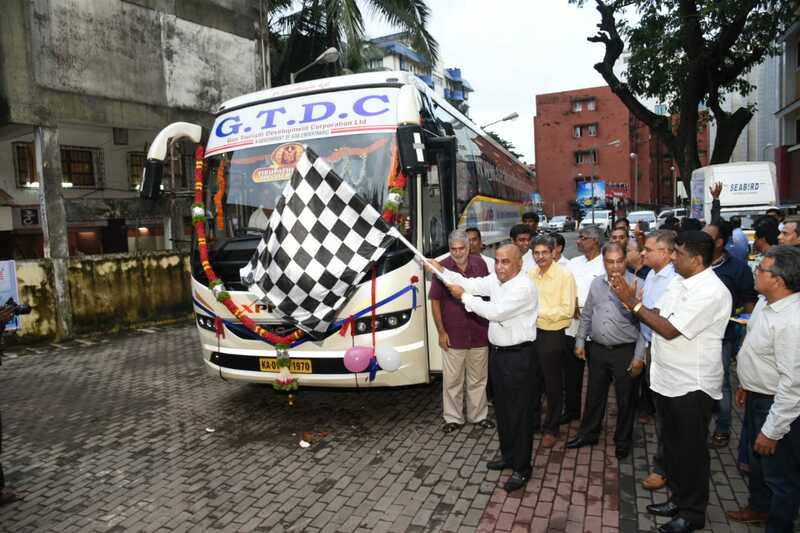 Secretary – Tourism, Mr. Sheo Pratap Singh also congratulated GTDC and its team for introducing pilgrimage tours from Goa and wished the Corporation’s endeavours great success. 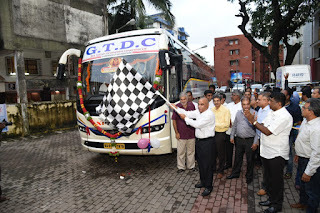 GTDC in association with SeaBird Travels launched the pilgrimage tours to Tirupathi which will facilitate a daily bus tour from Goa to Tirupathi and back in over two days and three nights. The multi-axle Volvo ac semi-sleeper coach service will begin from Mapusa and pick up passengers along the way (Panjim, Verna, Margao, Cuncolim and Canacona) and proceed to Tirupathi via Bangalore. The itinerary includes a 12 hour halt at Bangalore where the pilgrims can opt for sightseeing or accommodation facility for the day at an extra charge. The key highlight of the package is the facility of darshans at Tirupathi within a short time of one and a half hours as against the waiting time which extends to upto 5-6 hours. The package provides preferential service with special entry for Lord Balaji darshan at Tirumala, prashad, and also darshan of Goddess Padmavathi at Alamelu Mangapura before proceeding to Tirumala. The package priced at INR 4,000 also includes a link coach by APSRTC from Tirupathi to Tirumala, a guide and darshanticket. One complimentary breakfast and lunch at Tirupathi will also be provided. 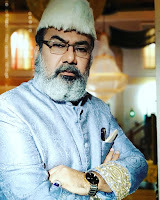 · Departure from Mapusa at 6.30 p.m.
· Departure for Tirupathi at 8.30 p.m.
· Departure from Tirupathi at 3.00 p.m.
· Arrival in Bangalore at 8.30 p.m.
· Short break and departure for Goa at 9.30 p.m.